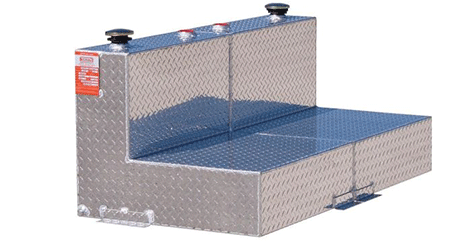 Our split tanks are designed for transporting and refueling two separated liquids legally on your flat bed or in the bed of your pickup truck. 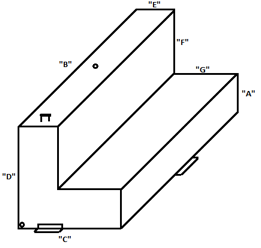 L-shape and Rectangle split fuel tanks are available. The Two- 2” bungs allow for reversing the fuel fill cap and fuel transfer pump to the side you prefer best. ATI refueling transfer tanks are designed and constructed with the industrial user in mind. Whether you are a farmer, contractor, municipality, or simply a private citizen, you can trust that your ATI tank will hold up and last a lifetime. We believe that in order to offer the best tank on the market, we need to start with the highest quality materials available. All of ATI’s tanks are manufactured here in the USA. Many manufacturers save a few dollars by outsourcing their fabrication without considering the overall quality of the finished product. Our refueling tanks are legal in all 50 states for gasoline, kerosene, methanol, diesel, and aviation fuel. 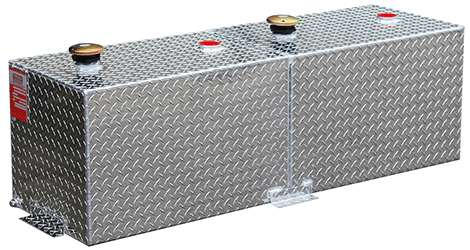 All ATI refueling tanks come standard with a 3/8″npt drain plug, two 2″npt bungs, a vent/prevent cap, and fully welded baffles to reduce slosh and add strength. These tanks are constructed from rugged diamond plate aluminum and are all available with a black or white powder coated finish. Custom wedge style aluminum refueling tanks are available upon request. Click here to fill out a custom tank form.